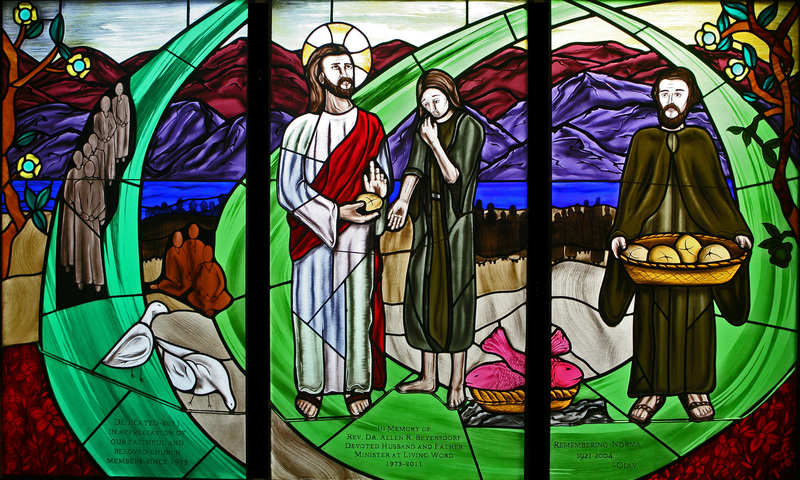 The Feeding of 5,000 is a pictorial stained glass window composed of three panels that illustrate the miracle of Christ feeding a large crowd from five barley loaves and two fish. The center panel depicts Christ looking upward toward heaven and blessing a barley loaf. Adjacent to Christ, is a boy with his hand extended toward the loaf and at his feet a basket with two fish. The right panel depicts a disciple holding a basket with the four additional barley loaves, while a suggestion of a crowd of 5,000 is illustrated slightly below the stained glass horizon line and left panel. Combined, the stained glass totals 37.65 sq. ft. It is made up of approximately 351 pieces of glass and five faceted teal green hand-pressed jewels that are located in the center of each yellow flower. Each piece of glass features traditional hand-painting techniques that date back to the 12th century, which includes glass-shading, tracing, texturing, and lettering. The vibrancy of color comes directly from the glass, although with two exceptions. The first exception utilizes brown colored enamels for Christ’s, the boy’s, and the disciple’s hair and facial hair. The second exception, as seen in Christ’s nimbus and the sky, utilizes silver nitrate stain on clear and blue tinted German New Antique (GNA) glass. Upon kiln firing, the silver nitrate stain turns golden amber in color. Similar to the other stained glass panels, the Feeding of 5,000 consists primarily of German New Antique (GNA) glass manufactured by DESAG, Germany. This machine drawn glass features striations reminiscent of antique hand-blown glass. Glass used for the two fish, yellow flowers, and the silhouettes of the three sitting people are examples of antique hand-blown glass. This glass was originally imported from France and Poland. Cathedral glass from Kokomo Opalescent Glass Co. Kokomo, Indiana comprises the clothing of Christ, the boy, and the disciple, in addition to the baskets, which are a “granite texture”, the two birds, the silhouettes in the left panel, and the branches and leaves. Perimeter came is 3/4″ wide, while internal came consists of 5/8″, 3/8″, 1/4″, 3/16″, and 1/8″. The lead came throughout all of the stained glass windows are functional and aesthetic. The solder is Canfield 60/40 (no relation to Brian) and putty is a secret formula from Bera Stained Glass Studios. The stained glass is reinforced with two horizontal 1/2″ by 1/8″ steel rebar bent and soldered to each panel in order to distribute the load (weight) more evenly. This window exhibits special features that in conjunction with The Nativity and Calming of the Sea maintain an overall design continuity. The most recognizable features include the use of a consistent horizon line, green circular bands, shared painting techniques, and glass selection. The less recognizable elements include the use of hand-pressed jewels, sky treatment, the use of white glass for the two birds in the Feeding of 5,000, the wave caps in Calming of the Sea, and the sheep in The Nativity, in addition to individual elements unique to each window.